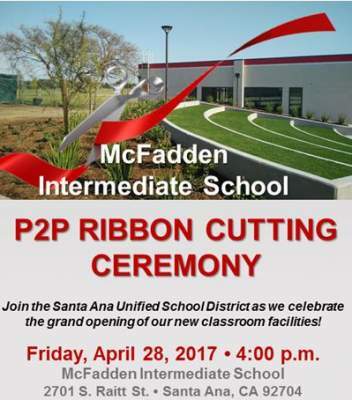 (April 27, 2017) – The McFadden Intermediate School community will celebrate the opening of its new building and outdoor learning environment at a public Ribbon Cutting Ceremony at 4 p.m. on Friday, April 28, 2017 at the school, 2701 S. Raitt St. in Santa Ana. The building has 10 classrooms and a STEM (Science, Technology, Engineering and Math) lab comprised of two classrooms. The building will house every grade level math teacher, allowing the school to pilot ability-based classrooms in math. One of the key features of the new building is an Outdoor Learning Environment that can hold up to three classrooms and has power outlets throughout. McFadden educates students in grades 6 to 8. Its STEM offerings include Robotics, Engineering and Design, Computer Science, Coding and more.